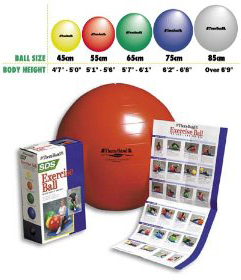 The Thera-Band Exercise Ball - SDS Anti-Burst Exercise Ball is a thick-skinned and sturdy home exercise ball that is made to private gym specs. The covering is manufactured for constant use and to resist the tendency to burst if punctured. Exercise ball workouts are becoming more popular for home fitness training. You want the best fitness ball to help you with your fat loss exercises and flexibility routines. This heavy duty home exercise ball is great as an accessory for your home cardio workout and home yoga workout. Why do people say the Thera Band Exercise Ball is the best? Please note: A pump DOES NOT come with this exercise ball. Filling it is a two-step process that initially involves leaving it partially filled over-night, then returning the next day to complete. Many users have had much better experiences with an air compressor as opposed to a bicycle pump. We see this as the best fitness ball because of its proven ruggedness and ease of use in rehabilitation environments, and extreme use at health clubs. It has been a great investment for our home fitness workouts.